Automakers are vying with companies such as Google, shown, to bring autonomous cars to the market. BERLIN (Reuters) -- The auto industry is stepping up efforts to introduce highly automated cars as software makers Google and perhaps even Apple forge plans to build a vehicle, Robert Bosch CEO Volkmar Denner said. Denner said the emergence of a prototype vehicle by Internet giant Google had already demonstrated the potential disruption of an Apple car. 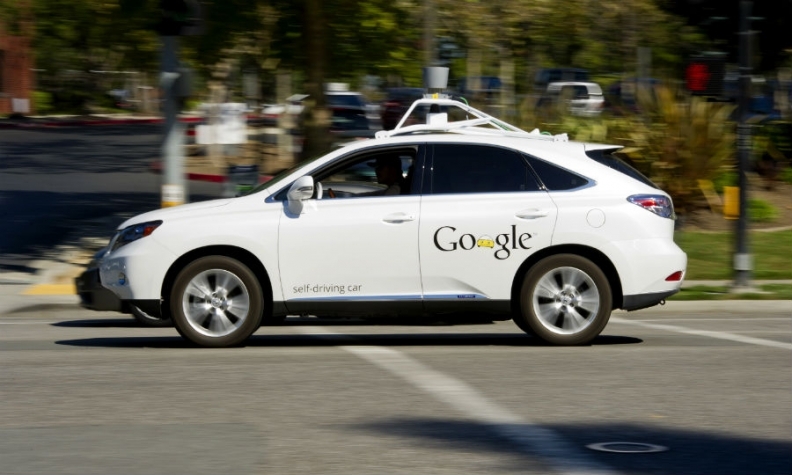 "Google is pushing the theme of self-driving cars very strongly. That's having a very positive effect for the entire automotive industry, because it enormously accelerates the pace of introducing drive-assist systems and semi-automatic functions," he said at a conference in Berlin. Apple is talking to experts at carmakers and automotive suppliers about how to make a self-driving electric car, a senior auto industry source told Reuters. Denner declined to comment on whether Bosch was working together with Apple to develop a car. "That's something many would like to know but unfortunately I cannot comment. We only talk about customer projects when they're implemented," he said. Apple has declined to comment on whether it will become a manufacturer of cars, but the speculation about the emergence of a new rival from Silicon Valley is enough to force the established industry to react, analysts and car executives said. Itay Michaeli, an auto analyst at Citi, said carmakers such as Ford and General Motors will now redouble efforts to introduce automation features to their vehicle fleet. "Even if no car is ever produced, it may accelerate the race to adopt 'Car of the Future' technologies," Michaeli said. Anybody who wants to build a self-driving car needs to understand sensors, algorithms and software, Denner said. If Apple really wanted to explore this market, it would probably talk with the entire industry, Denner said. The emergence of a new auto industry player will further intensify a war for talent, making it tougher for suppliers such as Bosch and established carmakers such as BMW, Daimler and Volkswagen to retain staff. "We can see competition for talent between tech companies in Silicon Valley. It's the usual fluctuation and, yes, Bosch is also suffering in this respect at its research and development center. But what I do not see as yet is an aggressive lobbying for our automotive experts here in Germany," Denner said.